I have been thinking about making cookies for about a week, I wanted to make something special, something different and unusual. 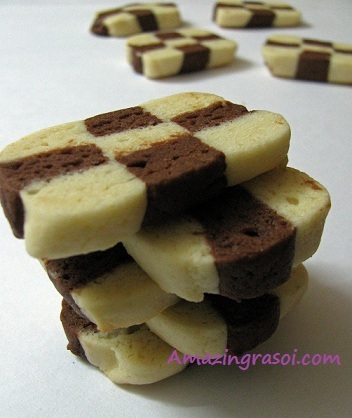 It was so much fun to make those neat little checkerboards cookies. They taste so good, so yummy that kids simply go crazy over them. In a wide bowl sift the all purpose flour, and baking pwd. Beat butter and sugar until light and fluffy. Add vanilla essence and mix well. Add the flour mixture to butter mixture and mix well. Shape it into a square and cover with plastic wrap. In a wide bowl sift the all purpose flour,cocoa pwd and baking pwd and mix well. Shape it into a rectangle with the thickness of 1/2 inch and cover with plastic wrap. Take out the vanilla rectangle dough from fridge and cut it into equal size strips of 1/2 inch. Take the Chocolate/cocoa rectangle dough and cut it into equal size strips of 1/2 inch. Form the checker board pattern as shown in the pictures. Roll in the butter paper or plastic wrap tightly and refrigerate until firm. Slice the block into 1/3 inch thick cookies with a sharp knife. Arrange the cookies on to baking tray 1 inch apart. Bake for 10-12 mins. Take care that the vanilla dough retains its color. Remove and let cookies cool for 5 mins before transferring to wire rack to cool completely.